Please note that due to capital projects in the City of Niagara Falls, many of the roads are being completely pulverized and repaved just after the labour day weekend. The bike course has been revised between kms 67.5 through 82.5. Cyclists will now be travelling next to the scenic Niagara River on the Parkway for 12km. We know this will be a great change for the 2018 race and we are also excited that our original course will be on newly paved roads in 2019! 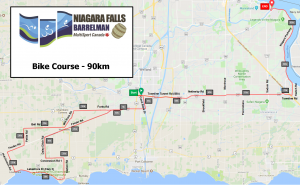 The course now takes you under the Welland Canal via Townline Tunnel Rd. As you enter the tunnel you will see the start of a coned lane. While you are riding through the tunnel, under the canal, you will be required to stay in the coned lane. Once clear of the tunnel, you will continue east on Townline Tunnel Rd and Netherby Rd. taking you over towards the Niagara Parkway. You will continue along Netherby Rd towards Fort Erie until reaching Townline Rd where you will turn right followed shortly after by a left onto Switch Rd. 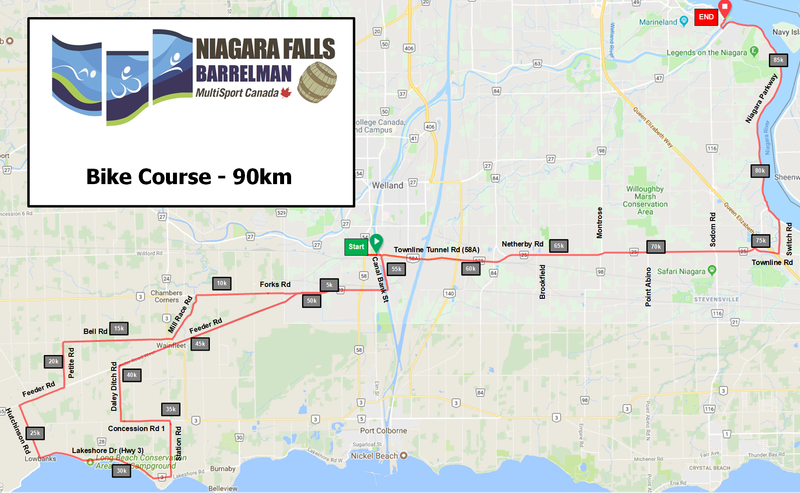 The course then turns north for the final stretch on the Parkway and, for the final 12km, travels alongside the Niagara River.